If you are a longtime follower of our blog, you would know that Eric loves board games. In fact, he’s written about some of his favorite board games on iOS: Cafe International, Stone Age, and For the Win. But as much as we appreciate these board games, we also realize that they are all made for adults. There are some apps that kids ages 7+ can play, like Bop It! and Boggle for iPad, but apart from Happy Geese, we have yet to find board game apps specially designed for small children. Well, at least until developers Very Nice Studio contacted us to review their newest app, Kate and Harry in Africa. Dubbed as a “cute, educational introduction to board games“, this app works best for children 3–6 years old. Kate and Harry in Africa supports both single and multiplayer modes. Kids can choose to play alone as Kate or Harry, or together with another player. Once a playing mode is selected, the game will reveal the game board: a panoramic scene of an African safari. Colorful circles are laid out atop the board, denoting the path which can be taken by the player. To move their character across the board, kids roll the dice by tapping on the icon on the bottom left of the screen. The app will then read out the number the player just rolled, and move the character accordingly. The app also keeps count as the character move between circles. Kids get to sit back and observe these actions until their character arrives at a fork in the path, at which point they decide which way the character should go. The character may also arrive at special circles, which are denoted by naughts or crosses. 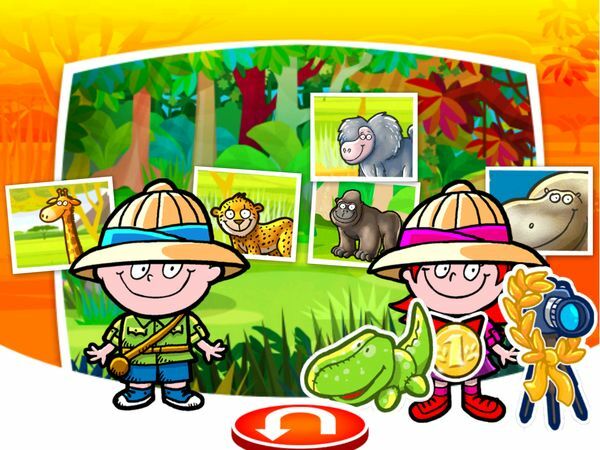 The circles with naughts will trigger a quick photo hunt, in which players try to snap a shot of a safari animal or collect a toy by tapping on it. The circles with crosses will either punish or reward. If the players are lucky, their character may get a boost and move several steps forward. If they are not so lucky, their character has to move several steps back. At the end of the game, players are rewarded with a celebratory scene. Their snapshots (and rewards) are also displayed. They are then free to repeat the game. Made specially for small children, the app contains no written instructions. Instead, it relies on visual cues and instructional graphics to provide juniors with hints on what to do next. Because of this, it is quite possible to use the app with non-readers and ESL kids. The app is also quite safe for kids. All ads, support links, and in-app purchases are put inside a protected section for parents, separate from the game play screen. To access this section, you must tap and hold the menu button for three seconds. Kate and Harry in Africa is a unique app. As I’ve mentioned before, board game apps for young kids are rare, so it’s nice to see an app that fills that gap. But more than just a grand idea, the app is also executed really well. The graphics and animations are just lovely, utilizing bright colors that appeal to juniors. I like how the African safari is depicted as a diverse environment that contains human villages, grassland, river, and forest. Although the app doesn’t explicitly provide information about the place, it actually makes an interesting topic to discuss with kids. I also like how the gameplay is so forgiving and stress-free. There is no timer or pressure for finishing the game as quickly as possible, and despite having multiplayer mode, there is actually little distinction between first place and last. The developers themselves mention that the road is that matters, but it is up to kids to decide if they want to compete. Kate and Harry in Africa is a lovely, well-made app that would make a great companion during road trips. The app features high quality graphics and animations, as well as a simple, intuitive, and stress-free gameplay that is suitable for its intended audience. Kids can also learn to count from 1–6 and explore the diverse African safari. If you have been looking to introduce your juniors to the fascinating world of board games, I would highly recommend this app.